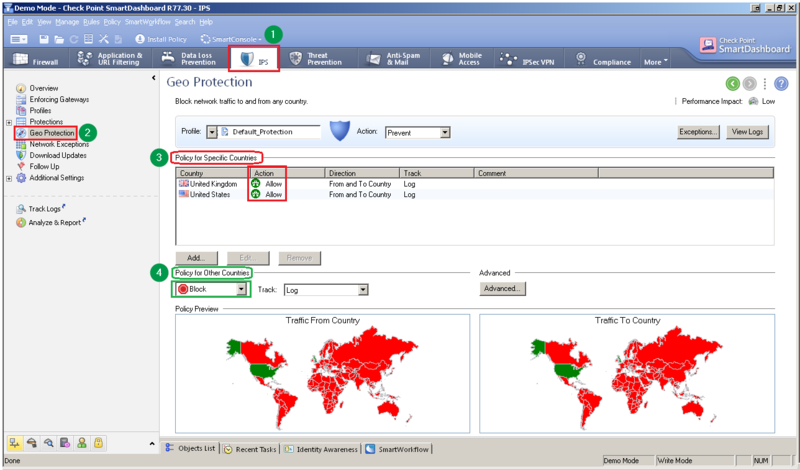 "Block" rules are configured in the "Policy for Other Countries"
Currently, such configuration ("whitelisting") is not fully supported by the IPS Geo Protection. if you do not wish to upgrade, Contact Check Point Support to get a Hotfix for this issue. Hotfix has to be installed on Security Gateway. Make sure to install the latest build of the CPUSE Agent. You can also use the sk111158 - Central Deployment Tool (CDT) to install this hotfix on Security Gateways. Note: You must be connected either over Console, or LOM card (SSH session could be disconnected). On VSX versions R75.40VS - R77.30, the Gaia CPUSE does not support installation of hotfixes (refer to sk92449 - section "(2)" - "VSX Gateways"). Configure a blacklist by creating "Block" rules for countries, from which you would like to block traffic, and configure "Allow" in the "Policy for Other Countries" section. For more information about Geo Protections, refer to the "Configuring Geo Protections" section in the R77 versions IPS Administration Guide.